368 pages | 37 B/W Illus. Recognizing a significant need to continually update the current body of knowledge on management development with the latest innovations in high quality research and practice in various parts of the globe, this book provides the most comprehensive and up-to-date work on the state of research and practice in management development. Provides a resource to HR practitioners and line managers to develop research-based and critically analyzed management development interventions. 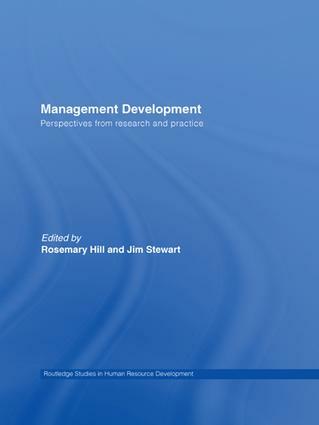 Drawing on the expertise of a wide array of contributors, the term ‘management development’ is explored and critically analyzed both conceptually and practically. This impressive volume is essential reading for students and academics across a range of subdisciplines including human recources development, human resources management and leadership. Rosemary Hill is a visiting research fellow in the Nottingham Business School and an independent HR consultant specializing in individual and organization development. Jim Stewart is Professor of HRD at Nottingham Business School.